If your Council achieves 75% net/net quota growth by December 31, 2018 the Council will be awarded a credit of $1.00 per billable member toward the State per capita assessment. Additionally, if your Council achieves 110% net/net quota growth by April 15, 2019 the Council will be awarded a credit of an additional $1.00 per billable member toward the State per capita assessment. A Council may qualify for a maximum of $2.00 per billable member credit. For example, if your Council has 150 billable members and your quota is 12 members and you recruit 9 members by December 31, 2018, your Council will be awarded a credit of $150.00 toward your State per capita assessment. If you continue your recruitment efforts and achieve 14 new members by April 15, 2019, your Council will be awarded another $1.00 per billable member toward your State per capita assessment. However, if your Council does not achieve the 75% goal by December 31, 2018 but does achieve the 110% goal by April15, 2019, you will be awarded a credit of $1.00 per billable member toward your per capita assessment. AB/NWT State Council has achieved the Circle of Honor this morning. It is with much gratitude that I express thanks to our leaders and members for their efforts in growing the Order and achieving this goal. Congratulations to those Councils that have already achieved Star Council status. Many Councils are very close to achieving Star Council needing only 1 or 2 or 3 new members in membership and/or insurance. You know who you are. 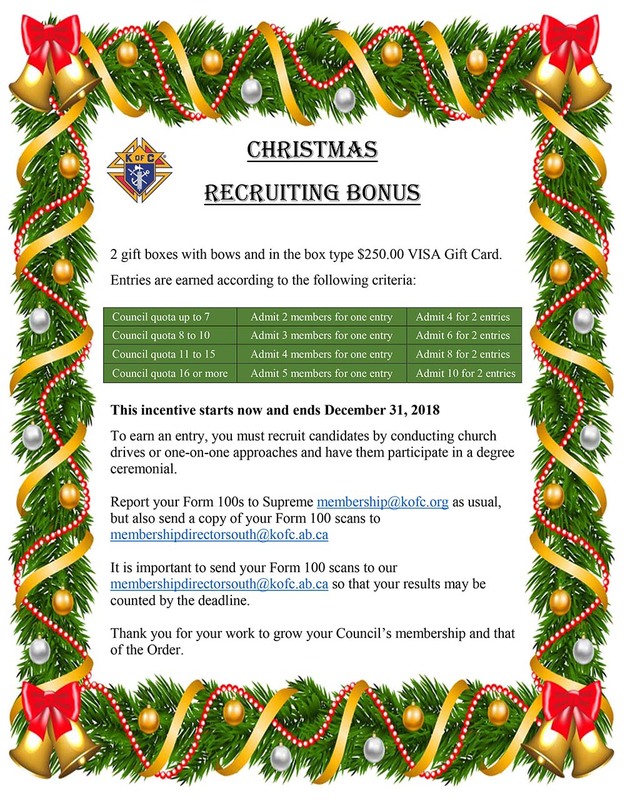 I encourage your Council to achieve your quotas and earn Star Council status to earn the Supreme Council credit of $4.50 per billable member. Remember the RECRUITERS $2000.00 JACKPOT !!! Sponsor more members for more entries in the draw. We achieved these results because we have asked Catholic gentlemen in our churches to join our Order. You informed them of our charitable works and brought them to an Admission exemplification. Let’s continue our efforts. You have participated in training sessions provided by State Council and Supreme Membership and Program Consultant, Guy Precourt to learn knowledge and develop skills for recruitment and retention. A new series of recruitment and retention videos have been produced in Canada and will be available at kofc.org/recruit1. These will be available in English and French. Canada’s efforts have been recognized by Supreme. Training opportunities will be continued next Columbian year. Regular and frequent admission degrees have yielded positive results. Monthly exemplifications have been held at St. Joseph High School, Ascension Parish, St. Patrick’s Parish and others. These help in planning Church drives. Many Councils are using the Supreme DVD or are reading the charges to initiate new members in their Council chambers. Good work. Order wide, 66% of new members are initiated using the DVD presentation. Formation exemplifications and Knighthood exemplifications have advanced many of our members in the Order. As a result you are ensuring succession and continuity of the leadership in your Councils. Recruiters $2000.00 Jackpot: 40 draws for $50.00 Earn an entry for each new member you sponsor. Promote your members to recruit to achieve Star Council status. 33 Councils earned 133 entries. Council 10060, St. Joseph’s College is the winner. At this time I wish to acknowledge the highly valued and immense unselfish contribution made by our Worthy Brother Wally Streit. Brother Wally has sponsored a total of 2222members into the Order. We offer our congratulations and many thanks. Please plan next year’s activities with dates in your Calendars. Involve your new Knights right away in Council activities and programs and mentor their advancement in the Order. Remember that you joined to do works of charity and to do something to support your church and community. Let us do something to support the people who have lost so much in the fires in Fort McMurray and other areas. Thank you for your efforts in growing your Councils. May we enjoy continuing success and growth to the end of this year.